"PIE" redirects here. For other uses, see PIE (disambiguation). Proto-Indo-European (PIE) is the linguistic reconstruction of the common ancestor of the Indo-European languages, the most widely spoken language family in the world. Far more work has gone into reconstructing PIE than any other proto-language, and it is by far the best understood of all proto-languages of its age. The vast majority of linguistic work during the 19th century was devoted to the reconstruction of PIE or its daughter proto-languages (such as Proto-Germanic and Proto-Indo-Iranian), and most of the modern techniques of linguistic reconstruction (such as the comparative method) were developed as a result. These methods supply all current knowledge concerning PIE since there is no written record of the language. PIE is estimated to have been spoken as a single language from 4500 BC to 2500 BC during the Late Neolithic to Early Bronze Age, though estimates vary by more than a thousand years. According to the prevailing Kurgan hypothesis, the original homeland of the Proto-Indo-Europeans may have been in the Pontic–Caspian steppe of Eastern Europe. The linguistic reconstruction of PIE has also provided insight into the culture and religion of its speakers. As Proto-Indo-Europeans became isolated from each other through the Indo-European migrations, the Proto-Indo-European language became spoken by the various groups in regional dialects which then underwent the Indo-European sound laws divergence, and along with shifts in morphology, these dialects slowly but eventually transformed into the known ancient Indo-European languages. From there, further linguistic divergence led to the evolution of their current descendants, the modern Indo-European languages. Today, the descendant languages, or daughter languages, of PIE with the most native speakers are Spanish, English, Portuguese, Hindustani (Hindi and Urdu), Bengali, Russian, Punjabi, German, Persian, French, Italian and Marathi. Hundreds of other living descendants of PIE range from languages as diverse as Albanian (gjuha shqipe), Kurdish (کوردی‎), Nepali (खस भाषा), Tsakonian (τσακώνικα), Ukrainian (українська мова), and Welsh (Cymraeg). PIE had an elaborate system of morphology that included inflectional suffixes (analogous to English life, lives, life's, lives'‍) as well as ablaut (vowel alterations, for example, as preserved in English sing, sang, sung) and accent. PIE nominals and pronouns had a complex system of declension, and verbs similarly had a complex system of conjugation. The PIE phonology, particles, numerals, and copula are also well-reconstructed. An asterisk is used to mark reconstructed words, such as *wódr̥ 'water', *ḱwṓ 'dog' (English hound), or *tréyes 'three (masculine)'. No direct evidence of PIE remains – scholars have reconstructed PIE from its present-day descendants using the comparative method. The comparative method follows the Neogrammarian rule: the Indo-European sound laws apply without exception. The method compares languages and uses the sound laws to find a common ancestor. For example, compare the pairs of words in Italian and English: piede and foot, padre and father, pesce and fish. Since there is a consistent correspondence of the initial consonants that emerges far too frequently to be coincidental, one can assume that these languages stem from a common parent language. Many consider William Jones, an Anglo-Welsh philologist and puisne judge in Bengal, to have begun Indo-European studies in 1786, when he postulated the common ancestry of Sanskrit, Latin, and Greek. However, he was not the first to make this observation. In the 1500s, European visitors to the Indian subcontinent became aware of similarities between Indo-Iranian languages and European languages, and as early as 1653 Marcus Zuerius van Boxhorn had published a proposal for a proto-language ("Scythian") for the following language families: Germanic, Romance, Greek, Baltic, Slavic, Celtic, and Iranian. In a memoir sent to the Académie des Inscriptions et Belles-Lettres in 1767 Gaston-Laurent Coeurdoux, a French Jesuit who spent all his life in India, had specifically demonstrated the analogy between Sanskrit and European languages. In some ways, Jones' work was less accurate than his predecessors', as he erroneously included Egyptian, Japanese and Chinese in the Indo-European languages, while omitting Hindi. In 1818 Rasmus Christian Rask elaborated the set of correspondences to include other Indo-European languages, such as Sanskrit and Greek, and the full range of consonants involved. In 1816 Franz Bopp published On the System of Conjugation in Sanskrit in which he investigated a common origin of Sanskrit, Persian, Greek, Latin, and German. In 1833 he began publishing the Comparative Grammar of Sanskrit, Zend, Greek, Latin, Lithuanian, Old Slavic, Gothic, and German. In 1822 Jacob Grimm formulated what became known as Grimm's law as a general rule in his Deutsche Grammatik. Grimm showed correlations between the Germanic and other Indo-European languages and demonstrated that sound change systematically transforms all words of a language. From the 1870s the Neogrammarians proposed that sound laws have no exceptions, as shown in Verner's law, published in 1876, which resolved apparent exceptions to Grimm's law by exploring the role that accent (stress) had played in language change. August Schleicher's A Compendium of the Comparative Grammar of the Indo-European, Sanskrit, Greek and Latin Languages (1874–77) represented an early attempt to reconstruct the proto-Indo-European language. By the early 1900s Indo-Europeanists had developed well-defined descriptions of PIE which scholars still accept today. Later, the discovery of the Anatolian and Tocharian languages added to the corpus of descendant languages. A new principle won wide acceptance in the laryngeal theory, which explained irregularities in the linguistic reconstruction of Proto-Indo-European phonology as the effects of hypothetical sounds which had disappeared from all documented languages, but which were later observed in excavated cuneiform tablets in Anatolian. Julius Pokorny's Indogermanisches etymologisches Wörterbuch ("Indo-European Etymological Dictionary", 1959) gave a detailed, though conservative, overview of the lexical knowledge then accumulated. Kuryłowicz's 1956 Apophonie gave a better understanding of Indo-European ablaut. From the 1960s, knowledge of Anatolian became robust enough to establish its relationship to PIE. Scholars have proposed multiple hypotheses about when, where, and by whom PIE was spoken. The Kurgan hypothesis, first put forward in 1956 by Marija Gimbutas, has become the most popular of these. [need quotation to verify] It proposes that the Yamna culture associated with the kurgans (burial mounds) on the Pontic–Caspian steppe north of the Black Sea were the original speakers of PIE. According to the theory, PIE became widespread because its speakers from the Kurgan culture could migrate into a vast area of Europe and Asia thanks to technologies such as the domestication of the horse, herding, and the use of wheeled vehicles. The people of these cultures were nomadic pastoralists, who, according to the model, by the early 3rd millennium BC had expanded throughout the Pontic–Caspian steppe and into Eastern Europe. Other theories include the Anatolian hypothesis, the Armenia hypothesis, the Paleolithic Continuity Theory, and the indigenous Aryans theory. Due to early language contact, there are some lexical similarities between the Proto-Kartvelian and Proto-Indo-European languages. An overview map summarises theories presented above. Common subgroups of Indo-European languages which are proposed include Italo-Celtic, Graeco-Aryan, Graeco-Armenian, Graeco-Phrygian, Daco-Thracian, and Thraco-Illyrian. The Lusitanian language is a marginally attested language found in the area of modern Portugal. The Paleo-Balkan languages, which occur in or near the Balkan peninsula, do not appear to be members of any of the subfamilies of PIE but are so poorly attested that proper classification of them is not possible. Albanian and Greek are the only surviving Indo-European languages in the group. a five-vowel system of which /e/ and /o/ were the most frequently occurring vowels. The Proto-Indo-European accent is reconstructed today as having had variable lexical stress, which could appear on any syllable and whose position often varied among different members of a paradigm (e.g. between singular and plural of a verbal paradigm). Stressed syllables received a higher pitch; therefore it is often said that PIE had a pitch accent. The location of the stress is associated with ablaut variations, especially between normal-grade vowels (/e/ and /o/) and zero-grade (i.e. lack of a vowel), but not entirely predictable from it. The accent is best preserved in Vedic Sanskrit and (in the case of nouns) Ancient Greek, and indirectly attested in a number of phenomena in other IE languages. To account for mismatches between the accent of Vedic Sanskrit and Ancient Greek, as well as a few other phenomena, a few historical linguists prefer to reconstruct PIE as a tone language where each morpheme had an inherent tone; the sequence of tones in a word then evolved, according to that hypothesis, into the placement of lexical stress in different ways in different IE branches. Proto-Indo-European roots were affix-lacking morphemes which carried the core lexical meaning of a word and were used to derive related words (e.g., "-friend-" in the English words "befriend", "friends", and "friend" by itself). Proto-Indo-European was a fusional language, in which inflectional morphemes signalled the grammatical relationships between words. This dependence on inflectional morphemes means that roots in PIE, unlike those found in English, were rarely found by themselves. A root plus a suffix formed a word stem, and a word stem plus a desinence (usually an ending) formed a word. Many morphemes in Proto-Indo-European had short e as their inherent vowel; the Indo-European ablaut is the change of this short e to short o, long e (ē), long o (ō), or no vowel. This variation in vowels occurred both within inflectional morphology (e.g., different grammatical forms of a noun or verb may have different vowels) and derivational morphology (e.g., a verb and an associated abstract verbal noun may have different vowels). Categories that PIE distinguished through ablaut were often also identifiable by contrasting endings, but the loss of these endings in some later Indo-European languages has led them to use ablaut alone to identify grammatical categories, as in the Modern English words sing, sang, sung. nominative: marks the subject of a verb, such as They in They ate. Words that follow a linking verb and rename the subject of that verb also use the nominative case. Thus, both They and linguists are in the nominative case in They are linguists. The nominative is the dictionary form of the noun. accusative: used for the direct object of a transitive verb. genitive: marks a noun as modifying another noun. dative: used to indicate the indirect object of a transitive verb, such as Jacob in Maria gave Jacob a drink. instrumental: marks the instrument or means by, or with which, the subject achieves or accomplishes an action. It may be either a physical object or an abstract concept. ablative: used to express motion away from something. locative: corresponds vaguely to the English prepositions in, on, at, and by. vocative: used for a word that identifies an addressee. A vocative expression is one of direct address where the identity of the party spoken to is set forth expressly within a sentence. For example, in the sentence, "I don't know, John", John is a vocative expression that indicates the party being addressed. allative: used as a type of locative case that expresses movement towards something. Only the Anatolian languages maintain this case, and it may not have existed in Proto-Indo-European at all. Proto-Indo-European pronouns are difficult to reconstruct, owing to their variety in later languages. PIE had personal pronouns in the first and second grammatical person, but not the third person, where demonstrative pronouns were used instead. The personal pronouns had their own unique forms and endings, and some had two distinct stems; this is most obvious in the first person singular where the two stems are still preserved in English I and me. There were also two varieties for the accusative, genitive and dative cases, a stressed and an enclitic form. perfective: verbs depicting a completed action or actions viewed as an entire process. indicative: indicates that something is a statement of fact; in other words, to express what the speaker considers to be a known state of affairs, as in declarative sentences. imperative: forms commands or requests, including the giving of prohibition or permission, or any other kind of advice or exhortation. optative: indicates a wish or hope. It is similar to the cohortative mood and is closely related to the subjunctive mood. active: used in a clause whose subject expresses the main verb's agent. mediopassive: for the middle voice and the passive voice. dual: referring to precisely two of the entities (objects or persons) identified by the noun or pronoun. plural: a number other than singular or dual. Verbs were also marked by a highly developed system of participles, one for each combination of tense and voice, and an assorted array of verbal nouns and adjectival formations. The following table shows a possible reconstruction of the PIE verb endings from Sihler, which largely represents the current consensus among Indo-Europeanists. Rather than specifically 100, *ḱm̥tóm may originally have meant "a large number". Proto-Indo-European particles could be used both as adverbs and postpositions, like *upo "under, below". The postpositions became prepositions in most daughter languages. Other reconstructible particles include negators (*ne, *mē), conjunctions (*kʷe "and", *wē "or" and others) and an interjection (*wai!, an expression of woe or agony). The syntax of the older Indo-European languages has been studied in earnest since at least the late nineteenth century, by such scholars as Hermann Hirt and Berthold Delbrück. In the second half of the twentieth century, interest in the topic increased and led to reconstructions of Proto-Indo-European syntax. Since all the early attested IE languages were inflectional, PIE is thought to have relied primarily on morphological markers, rather than word order, to signal syntactic relationships within sentences. Still, a default (unmarked) word order is thought to have existed in PIE. This was reconstructed by Jacob Wackernagel as being subject–verb–object (SVO), based on evidence in Vedic Sanskrit, and the SVO hypothesis still has some adherents, but as of 2015[update] the "broad consensus" among PIE scholars is that PIE would have been a subject–object–verb (SOV) language. The SOV default word order with other orders used to express emphasis (e.g., verb–subject–object to emphasise the verb) is attested in Old Indic, Old Iranian, Old Latin and Hittite, while traces of it can be found in the enclitic personal pronouns of the Tocharian languages. A shift from OV to VO order is posited to have occurred in late PIE since many of the descendant languages have this order: modern Greek, Romance and Albanian prefer SVO, Insular Celtic has VSO as the default order, and even the Anatolian languages show some signs of this word order shift. The inconsistent order preference in Baltic, Slavic and Germanic can be attributed to contact with outside OV languages. The Ridley Scott film Prometheus features an android named "David" (played by Michael Fassbender) who learns Proto-Indo-European to communicate with the "Engineer", an extraterrestrial whose race may have created humans. David practices PIE by reciting Schleicher's fable and goes on to attempt communication with the Engineer through PIE. Linguist Dr Anil Biltoo created the film's reconstructed dialogue and had an onscreen role teaching David Schleicher's fable. ^ "Archaeology et al: an Indo-European study" (PDF). School of History, Classics and Archaeology. The University of Edinburgh. 11 April 2018. Retrieved 1 December 2018. ^ López-Menchero, Fernando (2012). "Proto-Indo-European Etymological Dictionary" (PDF). Indo-European Language Association. Retrieved 1 December 2018. ^ Powell, Eric A. "Telling Tales in Proto-Indo-European". Archaeology. Retrieved 30 July 2017. ^ Fortson, Benjamin W. (2004). Indo-European language and culture: an introduction. Malden, Mass: Blackwell. p. 16. ISBN 1405103159. OCLC 54529041. ^ "Linguistics – The comparative method | science". Encyclopedia Brittanica. Retrieved 27 July 2016. ^ "Comparative linguistics". Encyclopædia Britannica. Retrieved 27 August 2016. ^ "Sir William Jones | British orientalist and jurist". Retrieved 3 September 2016. ^ Auroux, Sylvain (2000). History of the Language Sciences. Berlin, New York: Walter de Gruyter. p. 1156. ISBN 3-11-016735-2. ^ Roger Blench, Archaeology and Language: methods and issues. In: A Companion To Archaeology. J. Bintliff ed. 52–74. Oxford: Basil Blackwell, 2004. ^ Wheeler, Kip. "The Sanskrit Connection: Keeping Up With the Joneses". Dr.Wheeler's Website. Retrieved 16 April 2013. ^ "Franz Bopp | German philologist". Retrieved 26 August 2016. ^ "Grimm's law | linguistics". Retrieved 26 August 2016. ^ "Neogrammarian | German scholar". Retrieved 26 August 2016. ^ "August Schleicher | German linguist". Retrieved 26 August 2016. ^ Anthony, David W.; Ringe, Done (2015). "The Indo-European Homeland from Linguistic and Archaeological Perspectives". Annual Review of Linguistics. 1: 199–219. doi:10.1146/annurev-linguist-030514-124812. Abstract[:] Archaeological evidence and linguistic evidence converge in support of an origin of Indo-European languages on the Pontic-Caspian steppes around 4,000 years BCE. The evidence is so strong that arguments in support of other hypotheses should be reexamined. ^ Mallory, J. P. (1991). In Search of the Indo-Europeans. Thames & Hudson. p. 185. ISBN 978-0500276167. ^ Anthony, David W. (2007). The horse, the wheel, and language: how bronze-age riders from the Eurasian steppes shaped the modern world (8th reprint ed.). Princeton, N.J.: Princeton University Press. ISBN 0-691-05887-3. ^ a b Balter, Michael (13 February 2015). 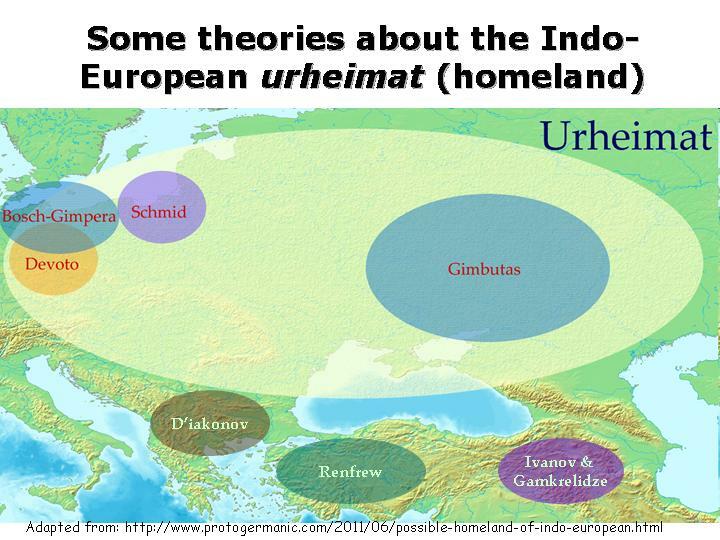 "Mysterious Indo-European homeland may have been in the steppes of Ukraine and Russia". Science. doi:10.1126/science.aaa7858. Retrieved 17 February 2015. ^ Gimbutas, Marija (1985). "Primary and Secondary Homeland of the Indo-Europeans: comments on Gamkrelidze-Ivanov articles". Journal of Indo-European Studies. 13 (1–2): 185–202. ^ Gamkrelidze, Th. & Ivanov, V. (1995). Indo-European and the Indo-Europeans: A Reconstruction and Historical Analysis of a Proto-Language and a Proto-Culture. 2 Vols. Berlin and New York: Mouton de Gruyter. ^ "Various hypothesis on origin of Indo-European language". ^ "Paleolithic Continuity Theory: Assumptions and Problems". Languages Of The World. 2 April 2015. Retrieved 23 January 2018. ^ Blažek, Václav. "On the internal classification of Indo-European languages: survey" (PDF). Retrieved 30 July 2016. ^ "Perfect Phylogenetic Networks: A New Methodology for Reconstructing the Evolutionary History of Natural Languages, pg. 396" (PDF). Archived (PDF) from the original on 5 November 2010. Retrieved 22 September 2010. ^ Fortson (2004), p. 16. ^ Fortson (2004), pp. 73–74. ^ Fortson (2004), p. 102. ^ Fortson (2004), pp. 102, 105. ^ a b Beekes, Robert; Gabriner, Paul (1995). Comparative Indo-European linguistics: an introduction. Amsterdam: J. Benjamins Publishing Company. pp. 147, 212–217, 233, 243. ISBN 978-1556195044. ^ a b Sihler, Andrew L. (1995). New comparative grammar of Greek and Latin. New York u. a.: Oxford Univ. Press. ISBN 0-19-508345-8. ^ Kulikov, Leonid; Lavidas, Nikolaos, eds. (2015). "Preface". Proto-Indo-European Syntax and its Development. John Benjamins. ^ a b Mallory, J. P.; Adams, Douglas Q., eds. (1997). "Proto-Indo-European". Encyclopedia of Indo-European Culture. Taylor & Francis. p. 463. ^ Hock, Hans Henrich (2015). "Proto-Indo-European verb-finality: Reconstruction, typology, validation". In Kulikov, Leonid; Lavidas, Nikolaos (eds.). Proto-Indo-European Syntax and its Development. John Benjamins. ^ a b Lehmann, Winfred P. (1974). Proto-Indo-European Syntax. University of Texas Press. p. 250. ^ Roush, George (20 June 2012). "'Prometheus' Secret Revealed: What Did David Say to the Engineer". Screen Crush. Retrieved 29 July 2017. ^ O'Brien, Lucy (14 October 2012). "Designing Prometheus". IGN. Retrieved 29 July 2017. Look up Appendix:List of Proto-Indo-European roots in Wiktionary, the free dictionary. Academia Prisca: 'Promoting North-West Indo-European as a modern language since 2005, with continuous reference to the parent Late Proto-Indo-European language'.